Welcome to July's Meezer Musings! We're well into the summer here now, so July's newsletter is all about staying cool and relaxing with some light summer reading. It's been an unusual month here in the UK with very hot weather mingling with some violent thunderstorms, so we've been alternately sheltering from the sun and the rain. Not very like the UK at all! Bandit behaves differently in hot weather. During the day he usually seeks out a cool, shady space under a bush where he can watch all the comings and goings (and mice and frogs) in the garden, but remain invisible himself. In previous summers he's tended to lose his appetite and eat less, which hasn't happened this year but he does seem to prefer to eat 'little and often' rather than gobbling up all his meal in one go as he does in the winter. You'll find some topical tips below for keeping your cat cool in hot weather if you happen to live in the northern hemisphere. Supply fresh cold water. In hot weather water evaporates very quickly. Check bowls twice daily - clean them out and fill them up! Some cats like ice cubes added to their water, some don't. If you'd like to experiment, provide a choice of iced and non-iced water. Feed wet food. Some cats don't drink enough water, a problem in hot weather. If you usually feed dry food, consider switching to wet, and add water. Bandit loves licking the gravy off his food, and I've found that adding water to make extra gravy is a sneaky way of getting more fluid into him. Provide shade. Indoors (and outdoors, if your cat's allowed out), make sure there's a cool, quiet shady area they can retreat to. Keep curtains closed or shades drawn when the sun's on the windows. Make 'cool spots'. As well as his garden hideout, Bandit loves lying on our cool, tiled kitchen floor when it's hot. Some cats choose to curl up in sinks, showers or baths, and laying wet towels in these areas can help. You can also create cool spaces by placing ice packs in cotton pillowcases in places where you cat likes to lie. Avoid strenuous play. Exercise generates heat, so keep play to a minimum in hot weather. Groom daily. Matted fur in long-haired cats traps heat, while fur with no tangles allows air to flow freely through the coat. Daily brushing for all cats removes excess fur, helping them keep cool. Never leave your cat in a parked car. On trips to the vet or if you're taking your cat on holiday, make sure your kitty's in a secure cat carrier, use air-conditioning if you have it, open the windows if you need to park, and stay with the cat to keep an eye on it. Summer vacations are the perfect time for discovering new books, and here's one I learned about earlier this month. I always love hearing about Siamese cats from all walks of life, and this month found out about Bailey, a seal point Siamese who lives on a boat which is usually moored in a marina near Rome. Recently though, Bailey and his humans have been voyaging around the Mediterranean. When not in port, Bailey travels snugly and securely in a special carrier while the humans are busy sailing, but he clearly loves his life afloat. Bailey has a blog and you can also follow his adventures on Facebook. Being Siamese, and therefore highly intelligent of course, he's also written a book. 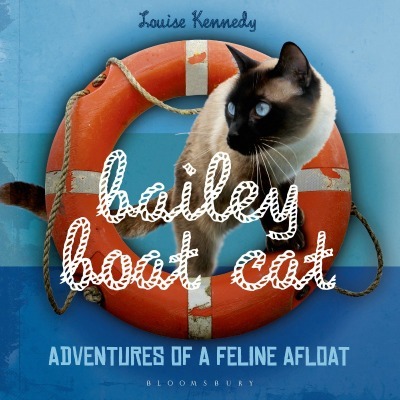 In Bailey Boat Cat, Adventures of a Feline Afloat (written with the assistance of Louise Kennedy!) he talks about sailing and navigation and boat skills, how to supervise humans and his dislike of pesky 'dinghy devils' (seagulls). Not to be missed for lovers of all things Siamese, you can read more about Bailey's book here. As you may already know, I'm a fan of Judy Schachner's work and love her books The Grannyman and Skippyjon Jones . Anyway ... 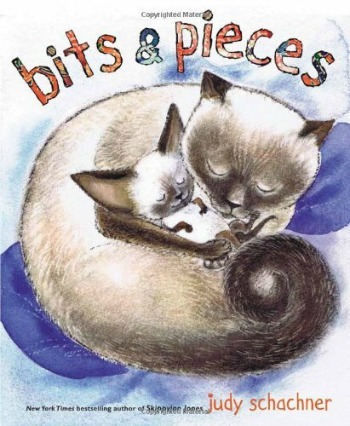 I recently found out that she brought out a book towards the end of 2013 called Bits & Pieces - a kind of follow-up to The Grannyman in that it features her cat Tink, the kitten who was introduced in The Grannyman and brought up by Judy's elderly cat Simon. In Bits & Pieces , Tink, now an elderly, indoor cat himself, with his own kitten to raise but suffering from a bad case of the wanderlust, manages to escape for a night of outdoor adventure on the evening of his 20th birthday. Does he find his way home again? Will Judy find out where he is, and reach him before he gets taken off to a shelter? Ahh ... you'll have to read the book to find out! I can tell you though that in real life, Tink survived his escapade and lived to the ripe old age of 21. And I can also tell you that the kitten introduced in Bits & Pieces was none other than Judy's cat Skippy - the model for the irrepressible kitty boy Skippyjon Jones himself! 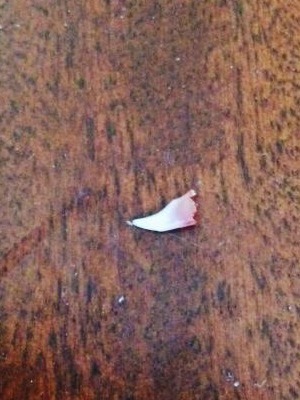 A visit from the Tooth Fairy? While we're on the subject of kittens (and a Tooth Fairy visiting a kitten is something I'm sure Judy Schachner would illustrate beautifully) we had a question on our Facebook page from Kelly, saying that her four-month-old kitten had lost a tooth and was this normal? I'm happy to say that yes, it is - like humans, cats have two sets of teeth and lose their baby ones at around four to six months old, once the adult teeth start to grow in. In many cases, kittens will actually swallow these baby teeth so you may not always notice when they drop - and this is quite normal too. Save it for the Tooth Fairy! There are two new featured breeders on the site this month, breeding very different types of cats. La Christa Cattery, east of Vancouver, BC in Canada specializes in the modern, wedgehead type of Siamese and also breeds Oriental Shorthair and occasionally, tortie Colorpoint Shorthair too. Our other new featured breeder is Jabuchs Balinese Cattery in Madisonville, Kentucky, and as their name suggests they breed Balinese cats (long-haired Siamese) and specialize in the traditional, Applehead body type. While I was adding these I made some changes to the breeders' listings so that Featured Breeders now appear at the top of the relevant regional section of the page (state, province or county) rather than all together at the top of the page. This makes it easier for visitors looking for breeders in a particular area to quickly see who's featured in that area. 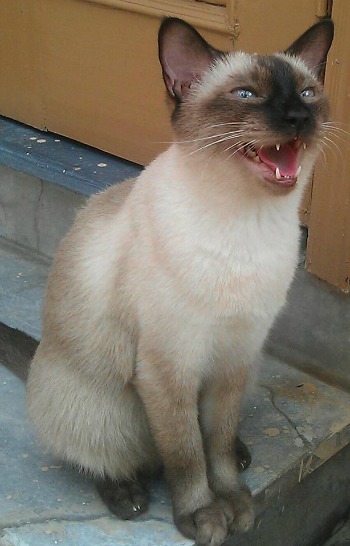 Our Meezer of the Month is Maani, belonging to Naila Afaq. Naila regularly posts photos to our Facebook page and has two beautiful Siamese cats, Maani (shown here) and Jimmy, a rapidly-growing, mischievous kitten. Naila called this photo 'Maani feeling hot' which I thought was very appropriate for this month's newsletter and our Meezer of the Month! Here's hoping that the rest of the summer (or winter!) is kind to you and you have a great month. We'll be back at the end of August, and hope to see you then. If you've enjoyed our newsletter and aren't already subscribed, you can do so below, and if you like us, please 'Like' us and share us with your friends!